ALTHOUGH the tulip originated in southeast Asia, the tiny European nation of Holland has transformed the flower into both a national symbol and a major foreign exchange-earner. Between March and May every year, when the tulips bloom, thousands of tourists rush to take in the sight of the rainbow colours that adorn the fields. However, the breathtaking and attractive floral display does not reveal the environmentally degrading processes the tulip flower industry used to produce it -- mainly, the contamination of water and soil by pesticides, chemical fertilisers and manure. The tulip flower industry is now under pressure to turn Green. Hans Muilerman of the Environment Federation of South Holland, which represents 80 groups, accuses tulip bulbgrowers of "continuous destruction of nature" in the past decade and of being "world champions in the use of pesticides. In the way this country implements regulations in this field, it's just a developing country." Tulip growers use on an average 120 kg of pesticides per acre, which is six times higher than in other forms of intensive agriculture in the Netherlands. The use of such huge amounts of pesticides poses problems for the soil, the water and the workers. For years, trade unions have called for improvements in working conditions, after research showed workers in the flower industry handling pesticides are more prone to developing skin and nervous system disorders. 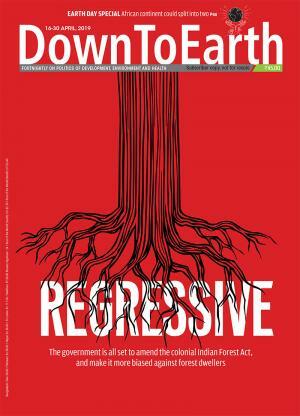 Conservative outlook The industry has acknowledged, belatedly, "an environment problem". Muilerman welcomes this recognition, says, "Only 5 per cent of the growers want to do something about it. 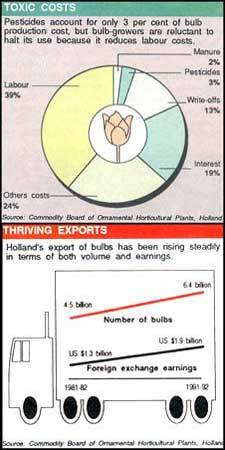 The bulb sector is a bulwark of conservatism." To put pressure on the reluctant 95 per cent, the federation launched campaigns in countries that import tulips to make foreign buyers aware of the practices that go into tulip-growing. Comments Muilerman: "We want the growers to feel hit in their pockets so that they will change to cleaner practices. It works very well." The biggest buyer is neighbouring Germany, followed by USA, France, Britain, Italy, Sweden, Japan and Canada. In 1991-92, foreign buyers lapped up about 75 per cent of the annual production of 8.5 billion bulbs, paying 1.1 billion guilders (US $1 = 1.80 guilders) for them. The foreign press has picked up the federation's publicity about "toxic bulbs". Domestically, too, environmentalists are pressing for more legal measures to reduce environmental damage. A recent report brought out by the federation, Bulb-growing has to be cleaner, lists 26 environmentally friendly growing techniques, including crop rotation, compulsory recycling of drainwater and greater control over manure use. Worried by the bad publicity, the International Flowerbulb Centre launched an international public relations campaign to counter the criticisms. Frans van Nimwegen of the centre admits Dutch growers could suffer a blow from "unbalanced reporting." The industry is also considering how to clean up its act. In the Netherlands, "green issues" are rapidly moving up the political agenda and bulb-growers realise they cannot ignore environmental aspects any longer. In 1990, organisations involved in the flower industry put their heads together with advisors from the agriculture board and set up an environment platform for the flowerbulb sector. Platform secretary Aad Vollebregt, whose office is in the International Bulb Centre in Hillegom, the heart of the flower region, considers himself an intermediary between the region's 3,500 bulb firms (mostly small family businesses with two or three employees) and officials from the department of agriculture, environmental groups, consumers, the press and the general public. "Environmental problems within the sector were underestimated," he admits. "Some small family businesses weren't even aware of new, cleaner practices. There was a need to speak with one voice to the outside world." The platform's aim is "a sustainable flowerbulb trade" and it bases its policy on the government's long-term plan for crop protection, which outlines adjustments that have to be made, but not always specifying alternatives. The plan says by the year 2000, pesticide use in key sectors has to be cut by 62 per cent of 1985 levels. "We have to make the state norm our norm," says Vollebregt. For bulbgrowers, the target is voluntary, but failure to hit it will result in action by the government. The platform's intention to achieve this target is spelt out partially in its first strategic environment plan for the flowerbulb sector, which emphasises crop rotation. But Vollebregt stresses changes will have to be made gradually. He criticises some of the government's plans, such as the need to reduce the concentration of manure in the flower sector, a policy which he says requires more research. Vollebregt notes, "In the government's third report on water economy, the state has set quality norms, such as a maximum of 2.2 milligrams of nitrate per litre. (Nitrates and phosphates cause problems in both groundwater and surface water.) The norms are based on rough calculations. We don't know where the present levels of nitrates come from: Acid rain may also play a part. Working towards these norms could mean we cannot grow bulbs at all. There is no consideration as to whether the norms are realistic or not. We have to get an insight into the real levels." Growers admit heavy pesticide use is common, partly to cut labour costs. In addition, with growers specialising and cutting down on crop varieties, there has been more intensive cultivation and consequently, a higher risk of diseases -- and thus more pesticide use. One factor of concern to environmental groups that the industry does not mention is the low cost of pesticides in the production process. According to the environment federation, bulbgrowers are reluctant to give up their "toxic addiction" partly because pesticides account for only 3 per cent of the cost of bulb production. In addition, Jan Water of the ministry of agriculture's horticulture department, which issues product quality certificates and "plant passports", argues pesticides guarantee that bulbs are free of diseases and viruses, a requirement enforced by the ministry and importing countries. Some countries, including the US, Canada and Japan, even employ inspectors to check bulb imports. The US is particularly concerned with eelworms and potato sickness; Japan looks at viral infections and the leaf fungus, bothrytus, and southern European countries ban bulbs with the fungus disease fusarium. The agriculture ministry launched two pilot research projects that aim at "environment-friendly flower bulb growing". Project manager Rob Stokkers says there is growing interest within the flower trade in the pilot project work. Last April, 200 growers turned up for an "open house", a response with which Stokkers was pleased. "Interest within the flowerbulb culture was enormous. Environment-friendly practices require a new way of thinking and the younger generation is more flexible in this respect," says Stokkers. Stokkers advocates crop rotation, greater industrial hygiene and the use of plants varieties that are less sensitive to diseases as key measures for growers to adopt. Of these, he accords priority to crop rotation involving growing tulips, narcissi, hyacinths and dahlias once in four years. But several growers are reluctant to rotate crops because it would mean lower profits: tulips yield about 45,000 guilders an acre, while narcissi pay only 33,000 guilders. To improve hygiene, Stokkers suggests the flowers are removed after the May bloom to prevent the leaf fungus bothrytus from taking hold. Says Stokkers: "This method will reduce the use of pesticides by 70-80 per cent. In practice, growers already carry this out." It will take upto eight years before an assessment can be made of the pilot projects. But Stokkers is confident the projects can meet the government's pesticide reduction goal by 2000. At the same time, Stokkers is equally certain that it will be impossible to ban pesticides altogether. "Particularly in fighting weeds," he says, "you cannot reduce the use of pesticides to nil. Disinfection remains vital before a bulb is put into the soil. Failure to do so will cause a lot of trouble." But Muilerman disagrees. He sees the ultimate solution as a totally pesticide-free "green bulb". Some organisations are already working on the idea. For instance, the Flower Auction in Aalsmeer has introduced an ecological hallmark that guarantees the flowers carrying it are grown without pesticides. This year, about 40 growers, including two major producers, are trying out the scheme. The Flower Auction foresees "biologically grown flowers" could account for 2 to 4 per cent of the total market. Industry as a whole resists the "green bulb" approach. Says Vollebregt: "The benefits for the environment from "green bulb" farming are not substantial. You would get a higher return when the entire tulip industry reduces the amount of pesticides used than when just a few companies stop spraying and others continue working along the same lines."